It's Day 5 of Bunny Week! I hope you've enjoyed the crafts and treats I've shared this week. I've titled today's post "Let's Hop!" for two reasons: I'm going to share some information about rabbits, including their favorite mode of transportation (hopping), plus my blog is one of the stops along the Fiskafriends Power of Community Blog Hop! So let's get hoppin'! 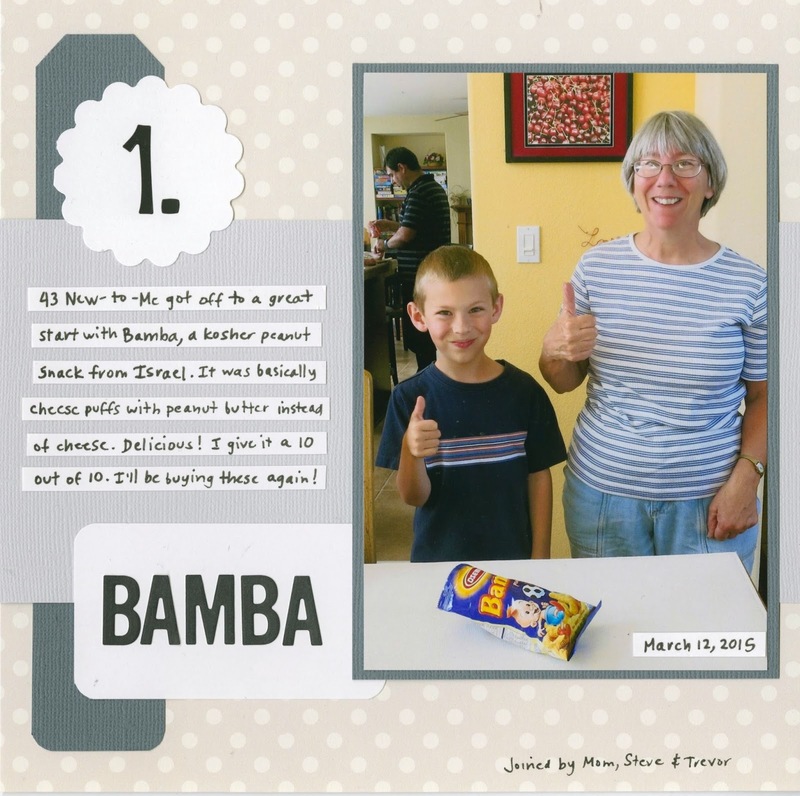 First, some information about the Blog Hop. From 2008-2013, I was a member of the wonderful Fiskateers online community. Fiskars closed the Fiskateers message board and gallery in December 2013. Many of us who met through Fiskateers are now part of the Fiskafriends Facebook group where we stay in touch and connect through our love of crafting. This weekend we are celebrating our First Anniversary with an "Anything Goes" Fiskafriends Blog Hop. The Hop begins tonight (March 27th) at 6:00 pm Pacific and will end on March 29th at 11:59 pm Pacific. Of course, there will be prizes along the way! Leave comments on each blog, including mine, to be in the running for some fabulous prizes. You can find all the details about the Blog Hop here. Now, let's end Bunny Week by learning what makes them such wonderful pets. Rabbits are affectionate. In the wild, they live in groups and are closely bonded with others. A pet rabbit bonds with his family too. Rabbits are smart. I left this bucket of apple branches about two feet to the left. Trouble struggled to scoot the bucket over, hopped up on the couch, and helped himself to one of his favorite foods. Rabbits love to play. Trouble will play catch with us by tossing an empty cardboard tube back and forth. He throws balls, loves knocking over block towers, and is interested in all of Trevor's toys. Rabbits are curious. The minute anything new enters the house, whether it's holiday decorations, a new toy, or just the mail, Trouble has to investigate it immediately. Rabbit toys are cheap. Items like empty boxes, cardboard tubes, and an old phone book provide hours of entertainment for a rabbit. Rabbits make good watchdogs. OK, so they don't bark to scare off strangers and they're not going to intimidate anyone, but simply by watching Trouble's ears swivel toward the front of the house, we know that someone has driven by or is walking toward our door! It's amazing how much Trouble can communicate with his ears. Rabbits are very clean. Trouble uses a litterbox when he is indoors. He keeps himself very clean, even when he's outdoors, as you can see in this video. Rabbits are fast. Really fast. They can outrun you no matter how fast you are and they LOVE to prove it. When they're feeling especially giddy about it, they'll wiggle their tails as a playful reminder that they are WAY faster than you. Rabbits are entertaining. Not a day goes by that Trouble doesn't do something that cracks me up. One day, he was racing back and forth on the couch. When I peeked over the ledge upstairs in hopes of catching it on video, he started periscoping to peek back at me. Rabbits are amazing. Take your mouse and trace the arc of Trouble's jump to get a sense of how far rabbits can go in a single bound. I'd guess his farthest jumps are around 10 feet. He can jump straight up about 3 feet. Rabbits inspire some pretty darn cute crafts. (If I do say so myself). You can see all my bunny-related crafts, including these Bunny Donuts, here. There are thousands of affectionate, smart, playful, curious, attentive, clean, fast, entertaining, amazing, inspirational, adorable rabbits out there who need a Forever Home. If you can provide a safe and loving home to a rabbit for approximately 10 years, consider adopting a rabbit from rabbit rescue organization or shelter. Trouble has brought us so much joy and is truly part of our family. 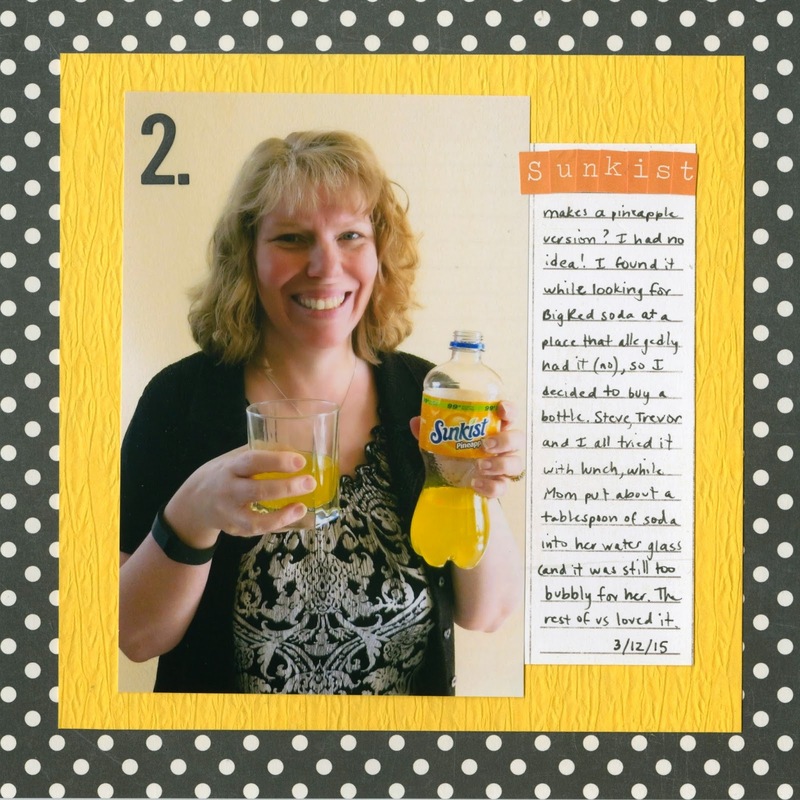 Now hop along to the rest of the my Fiskafriends' blogs. Don't forget to leave a comment at each stop to be in the running for the Blog Hop prizes! 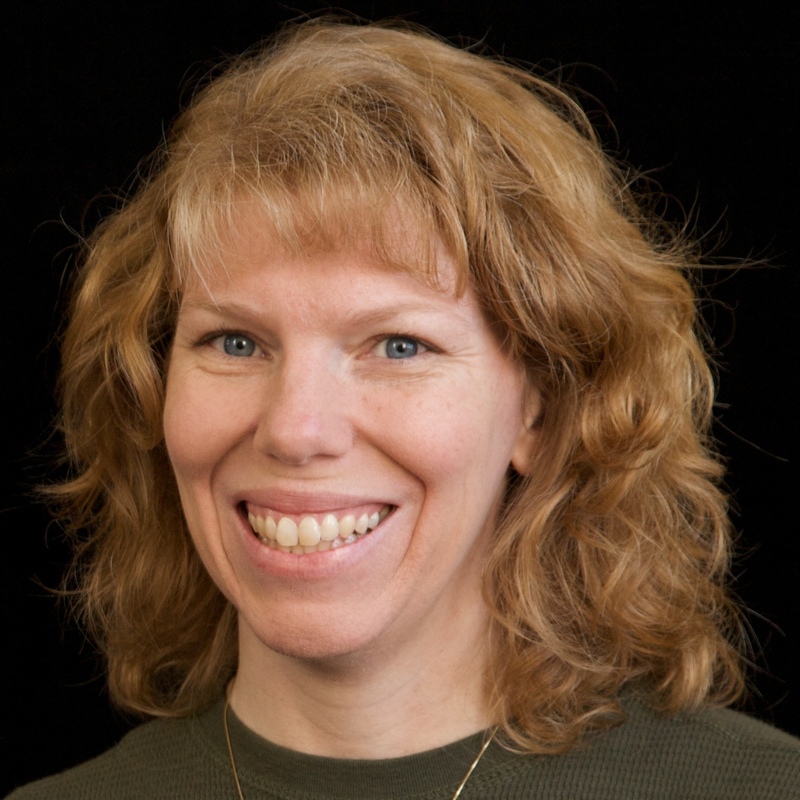 Cindy deRosier, #4113, That's me! It's Day 4 of Bunny Week! Trouble loves to watch our art projects. Whenever possible, he's right there with the action. Of course, we supervise carefully to make sure he doesn't eat anything inappropriate or do anything else dangerous. He's always very interested in sniffing our egg dye. He's never spilled it, thankfully. I did today's project while Trouble was napping in his pear box, far away from the not-safe-for-rabbits materials. It's a cocoa kit! Materials: white mug, plastic spoons, white Candy Melts, pink sprinkles, cocoa mix, bag and twist tie, mini marshmallows, plastic wrap, googly eyes, pink craft foam, wire, and Glue Dots. Start by melting Candy Melts and dipping the spoons into them. Immediately add pink sprinkles, then set them aside to harden. Pour about five servings of your cocoa mix into a food-safe decorative bag and twist it securely. Nestle the cocoa in the bottom of the mug. Wrap a bunch of marshmallows in plastic wrap, then place them on top of the cocoa. When the candy spoons are completely set, wrap them with plastic wrap, then nestle them into the mug. Use loose marshmallows to provide support if necessary. The lucky recipient can enjoy hot cocoa with mini marshmallows, a candy spoon, or both! It's Day 3 of Bunny Week and I have another art idea to share! Thanks for your help, Trouble, but this project doesn't require newspaper. Today's project is carved bunny stamps. 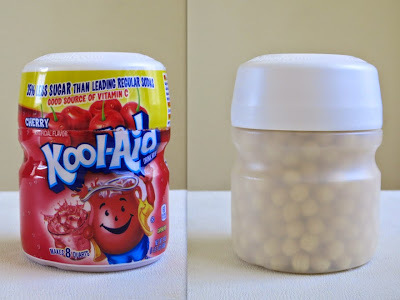 You will need: 2 small chunks of styrofoam, a pencil, a knife, paint, cardstock, and Sharpies. Use the pencil to sketch a circle about the size of a tennis ball on a chunk of styrofoam. This will be the rabbit's face. On a separate piece of styrofoam, draw an oval about the size of an egg. This will be split in two to make the rabbit's ears. The next step is carving the stamps. Trevor has gone through knife safety training in Cub Scouts and is qualified to use a pocket knife. Occasions to practice his knife skills don't come up often, so I let him use his pocket knife for this project. A serrated plastic knife would work just as well, if not better. A pumpkin cutter would probably also work and would be even safer. Regardless of what knife you use, secure the styrofoam with your non-dominant hand, pencil sketch side up, and carve the circle shape down at an angle. Rotate the stamp and continue until the top of the styrofoam matches the pencil sketch. Do the same for the oval stamp, then cut down the center to form two matching ears. When you are happy with your stamps, apply a thick coat of acrylic paint to each of the three parts. Trevor discovered that the best method is to squeeze large blobs of paint directly onto the stamps (as shown below) and then gently spread it out with a brush to cover the whole stamp. Stamp the circle shape onto a piece of cardstock, then stamp the ears on top. The styrofoam gives it a fun texture. As you can see below, Trevor did some experimenting with different ear placement. By rotating the ears 180°, switching left with right, and changing the angles, he was able to create different looks. Let the paint dry thoroughly. Because it is thick, overnight is best. When it is completely dry, use Sharpies to draw in facial features. Trevor had a lot of fun experimenting with different paint colors. This was the last one he stamped. He loved the way the pinks, browns, blues and tans he'd used previously blended to create what he called a camouflage bunny. 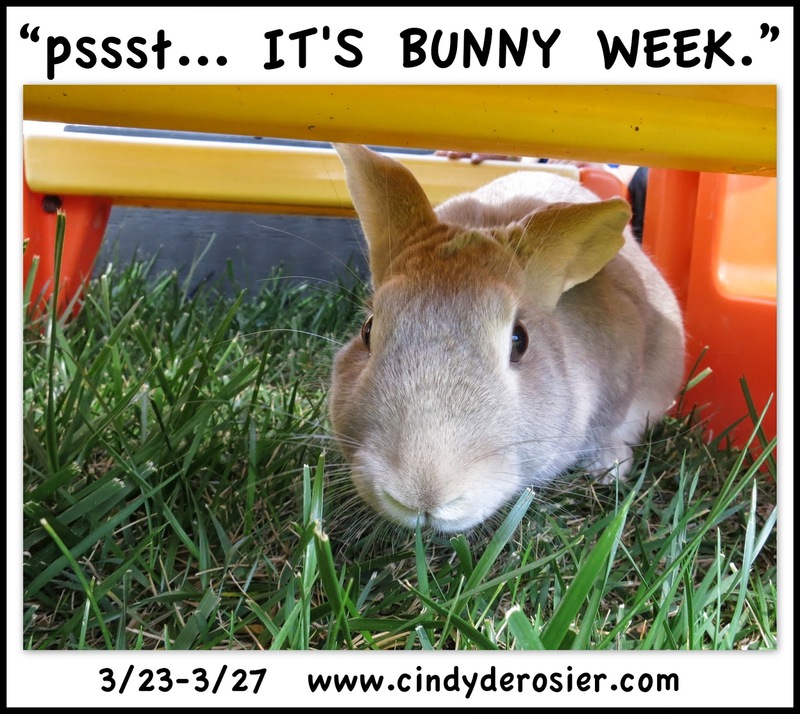 It's Day 2 of Bunny Week here at My Creative Life! I've never heard of a rabbit that didn't LOVE treats. Trouble is no exception. He'll do practically anything for broccoli (including rabbit dressage), raisins (check out the video of him with his Bunny Einstein), or other favorites like Bunny Biscuits, strawberries, bananas, and other fruits. We are very careful to limit how many treats he gets though. 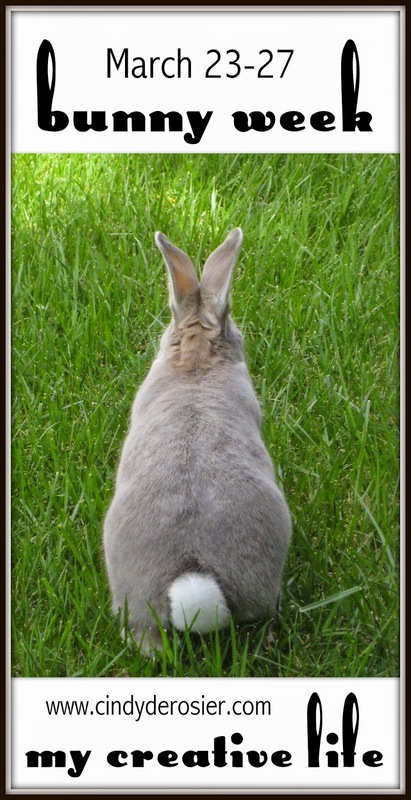 The bulk of a rabbit's diet should be hay, with fresh greens second. Fruit and sweet vegetables like carrots are treats and should be given infrequently and in very small amounts. Of course, the deRosier humans are just as fond of treats as Trouble is. We're celebrating Bunny Week with some very tasty bunny-shaped chocolates. To be clear, these are for people only! Steve and Trevor shopped for my birthday gifts at Michaels, with the bulk of their selections from the candymaking aisle. They bought me Wilton Candy Melts in almost every color of the rainbow, along with candy flavorings and candy decorating pens. They also got me an awesome bunny silicone mold. I asked Trevor which color and flavor of candy bunnies we should make for Bunny Week. He said, "All!" as if there were any other possibility. I should have predicted that! The pack of candy flavorings included peppermint, cherry, creme de menthe and cinnamon. I already owned raspberry and lemon flavorings. So I told Trevor that we could make six different colors/flavors of candies. It was fascinating to see what colors Trevor chose for each flavor. The purple is peppermint, the orange is lemon, the grey-tan (mixed carefully to mimic Trouble's coloring) is raspberry, the blue is cherry, the light grey is cinnamon and the green is creme de menthe (hey, one that makes sense!). We had a small amount of extra green, so we divided what we had between two bunny candies, filled the rest in with chocolate and swirled. Here are the candies, ready to go into the freezer. Once they set, we popped them out of the mold and started decorating. The pens worked beautifully. Trevor decorated a set for himself and then did a second set for Daddy. Here are Trevor's bunny candies. For the record, the striped one is a Zebra Bunny, not a Convict Bunny. Here are six of my bunny candies. I wasn't nearly as creative in my decorating as Trevor was. I love how these turned out! Adorable and totally delicious. Expect to see more bunny-shaped foods from me in the near future. Welcome to the 3rd annual Bunny Week here at My Creative Life! 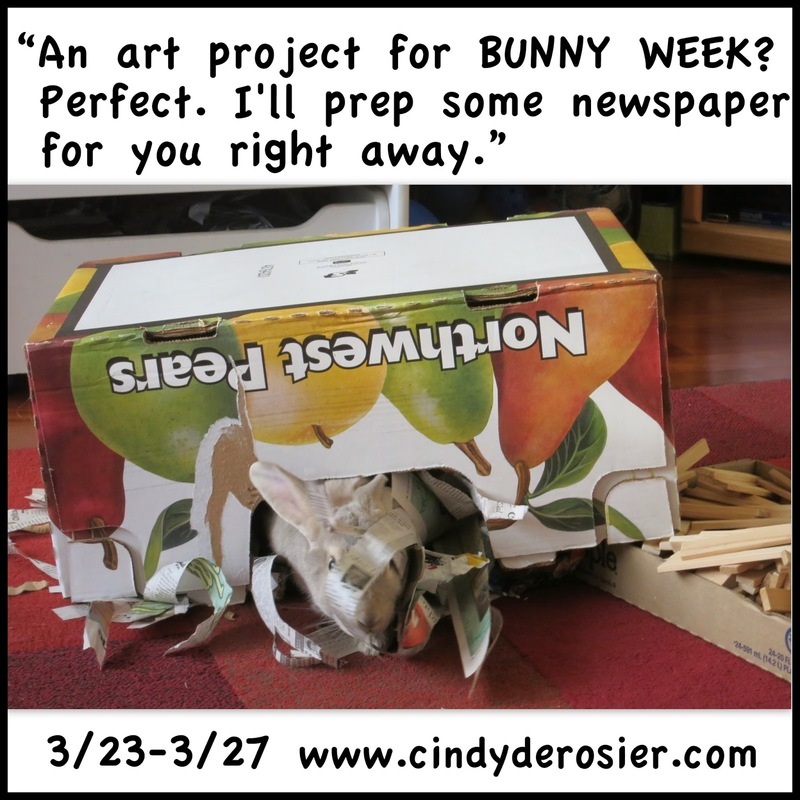 All week long, I'll be sharing rabbit-themed crafts and information. It's like Shark Week, only fuzzier. 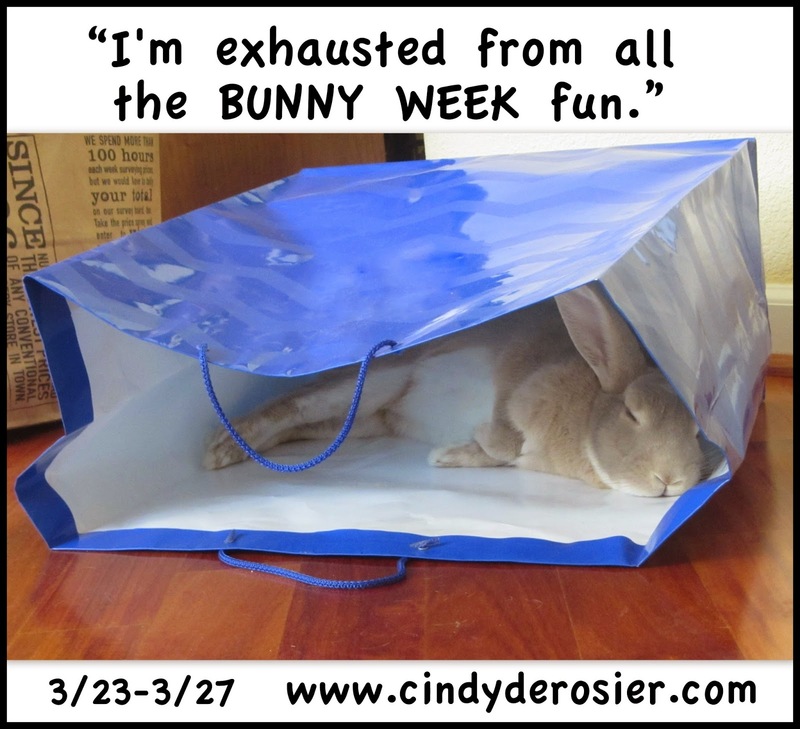 If you're a new reader this year, I'd recommend going back and reading previous years' Bunny Week posts. 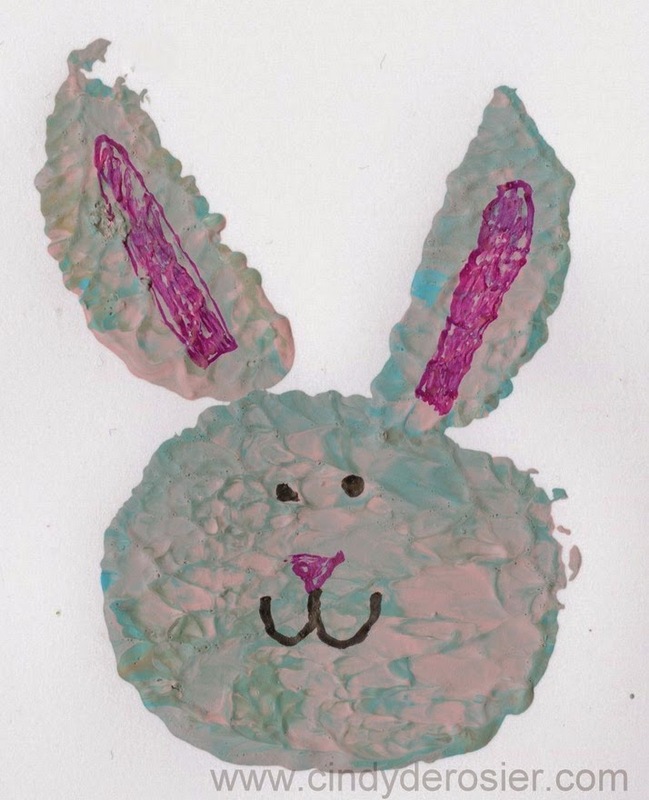 Or, you can see all my rabbit-themed crafts, scrapbook layouts, videos, foods, and more here. 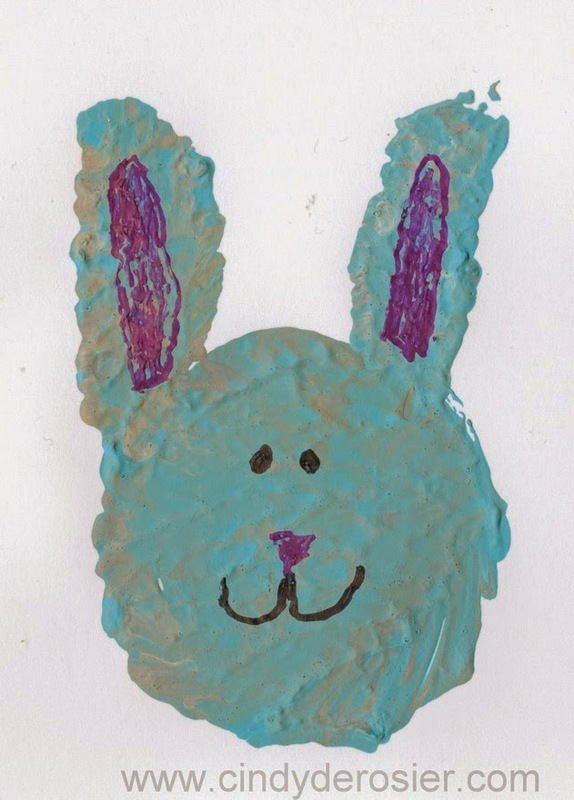 OK, let's start Bunny Week 2015 off with a fun and easy kids' craft! 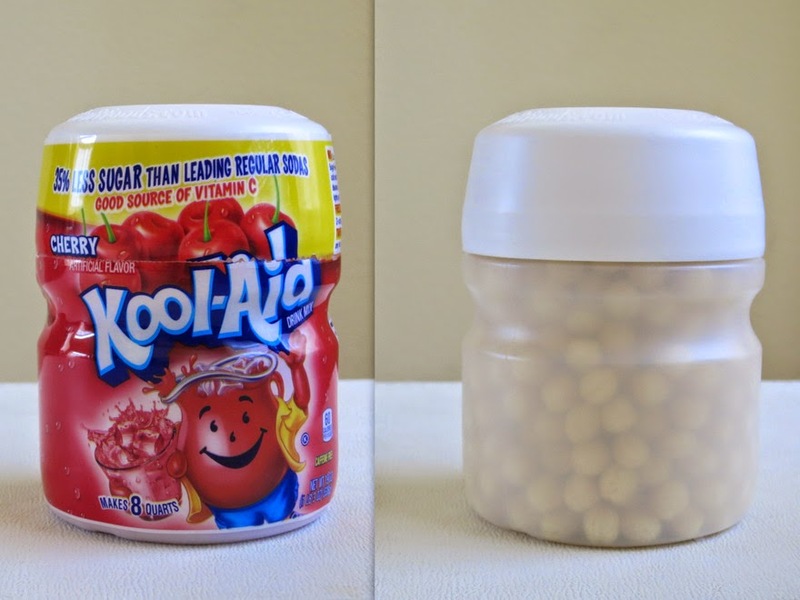 ... or, you can wash and dry the container and fill it with a treat. Trevor chose to put Kix in his bunny. The only other materials are white craft foam, pink craft foam, googly eyes, ribbon and a glue gun. Start by cutting out white craft foam ears. You'll want a slanted base on each ear. Adjust the angle until you're happy with them. Cut a small triangle from pink craft foam for the nose. Glue each feature in place. Hold the ears upright for a few seconds until the glue sets. Finally, tie a ribbon around your bunny's neck. I opted to add a bow to my girl bunny. Cute, right?! And so easy. 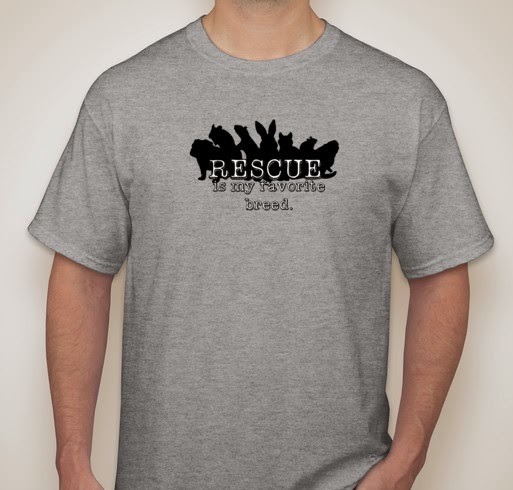 And, as promised, it's time to pick a winner for the "Rescue is My Favorite Breed" t-shirt, benefitting Contra Costa Rabbit Rescue! Random.org chose #12, so the lucky winner is Miriam! Congratulations! Send me your t-shirt size and address at cindy.derosier at gmail.com. 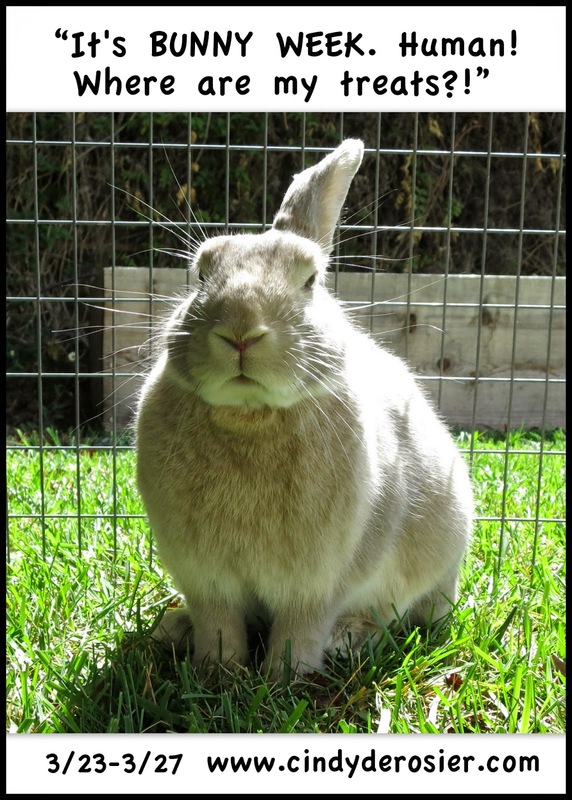 I've blogged many times about the adventures of the beloved fourth member of our family, our rabbit Trouble. Trouble is a house rabbit; he has a large enclosure where he stays at night, but otherwise, he is free roaming, like a dog or cat. And just like a dog or cat would be, Trouble truly is a member of our family. We love him. Trouble's mom was rescued from a filthy house with hundreds of rabbits. Trouble was born in foster care two days later. We adopted him from Contra Costa Rabbit Rescue when he was 8 months old. It's one of the best decisions we've ever made. I'm embarrassed to say that before I knew anything about rabbits and we were considering one for Trevor, I started researching different breeds and looking into local breeders. I learned what traits were characteristic of different breeds. Fortunately, I also started looking into rabbit availability at shelters and pounds. I was horrified to see how many beautiful, loving rabbits needed a home. I hadn't had any idea that this was such a problem. Once I did, I knew that a rescue was the only choice for us. We browsed through the list of adoptable rabbits at CCRR and asked to meet three of them, including Trouble. They were all wonderful, but it was clear immediately that Trouble was the right bunny for us. Contra Costa Rabbit Rescue is raising funds to help with the medical care of the rabbits awaiting their Forever Homes by selling these awesome t-shirts. We are getting them for the three of us and I'd like to buy one for a lucky reader as well! If you currently have a rescued animal or have adopted one in the past, regardless of species, leave a comment letting me know the name and species. I'll pick a winner on Monday. 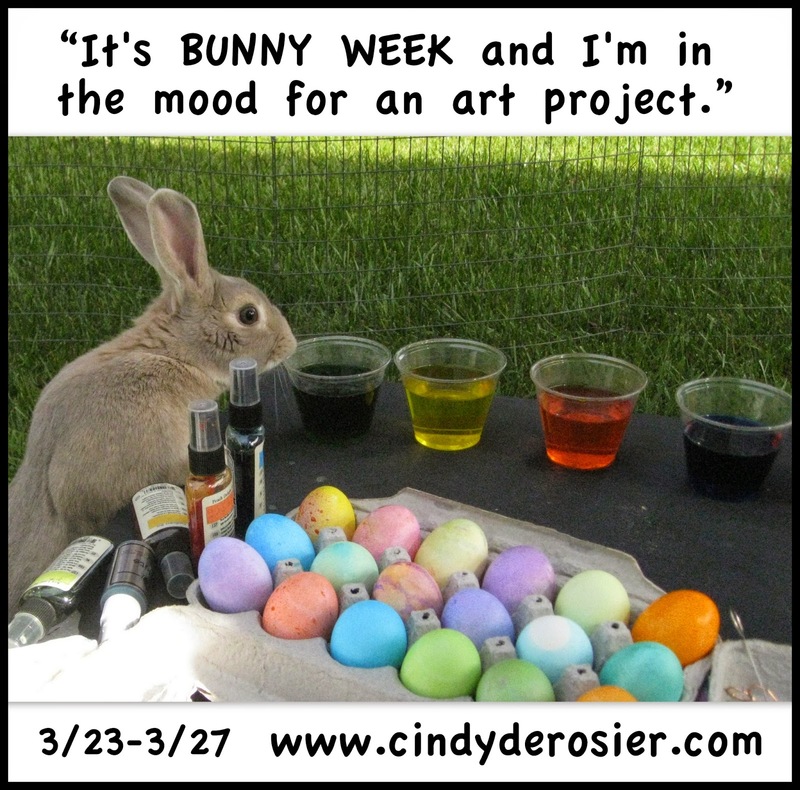 It's the start of the annual Bunny Week here at My Creative Life! Just like in past years, I'll be sharing a week's worth of bunny crafts, bunny information, and all things bunny. I'm really excited! 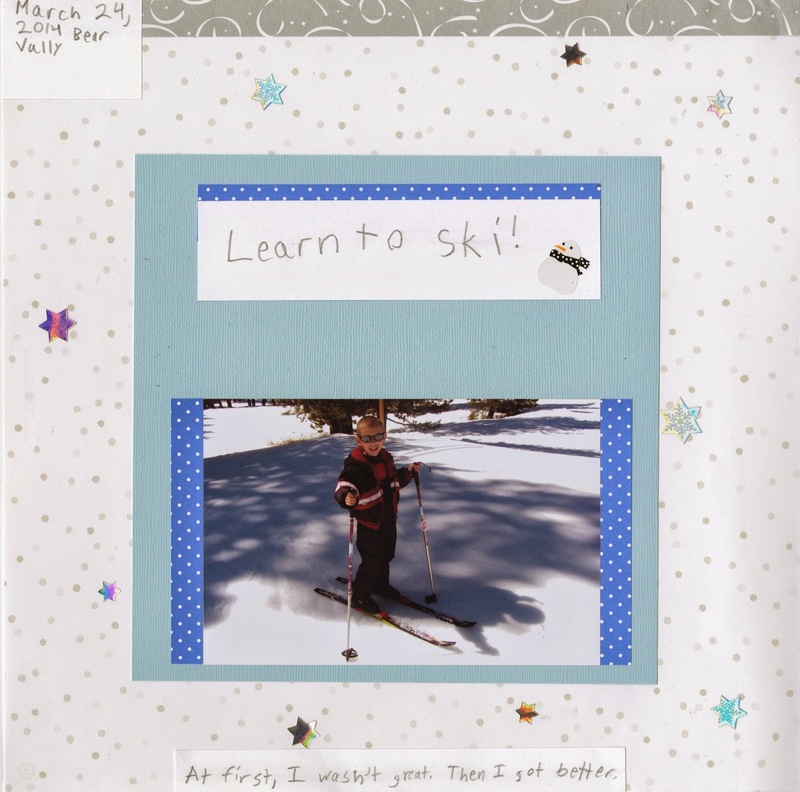 After he made his first scrapbook layout, there was no stopping Trevor. Here are his 2nd and 3rd pages. This is a page about his first time on skis. You can see my page about the same thing here. In fact, I used the same photo (and four others) on my layout. For the past year or so, I've been hopping around between photo developers on a quest to find the one with the photo-developing holy trinity of decent quality, acceptable price, and reasonable wait time. When I printed the skiing photos, the developer was very cheap and very fast. But the photos were unacceptably dark, so I printed them again with someone else and scrapped those. Trevor dug this too-dark photo out of my printed-but-didn't-scrap pile. I offered to have it reprinted before he scrapped it, but any wait time is too long for him when he's inspired to create, so he happily used it as is. Trevor chose two photos from our most recent Bear Valley trip to scrap next. 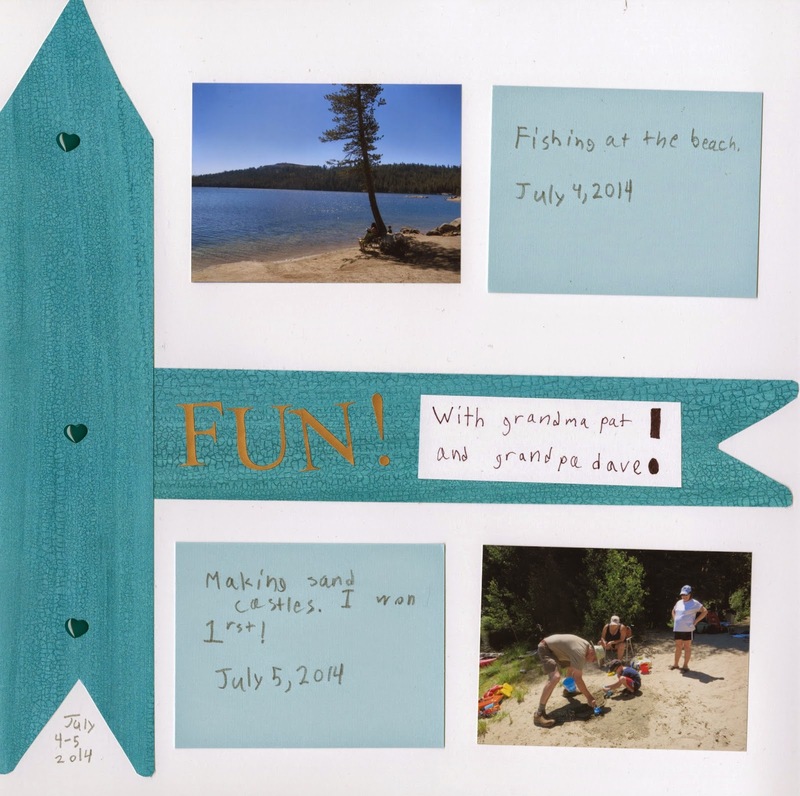 He specifically looked for pictures of him with his grandparents and titled his page "FUN! With grandma pat and grandpa dave!" My layout about the same trip is here. Trevor has asked me to print photos from his Cub Scout overnight at the USS Hornet and from his ice skating recital for him to scrap. He also has a school photo he wants to scrap. Once he realized that he can enter his layouts in the fair, he's even more motivated to finish more pages. I love that. It'd been awhile since my last turn doing a deRosier Chopped Challenge, so I invited Jonna over and asked Steve and Trevor to shop for the mystery ingredients. As a fun twist, I requested that one of the ingredients fit my 43 New-to-Me birthday challenge, a food I'd never tried before. This event took place on Saturday, 3/14... aka, Pi Day. So I'd already decided that no matter what my ingredients were, I'd try to make them into a pie. But my four ingredients did not sound like they would combine to make a tasty pie. With no backup plan for dinner, we'd be stuck eating whatever I made and I really didn't want a Macaroni Edamame Peach Steak Pie. So I decided to bend the rules a bit and created one entree and one dessert using the ingredients. I diced the peach and left it to macerate in brown sugar, then turned my attention to the edamame. I love green, soft, slightly-salty, boiled edamame and wasn't sure how this black roasted version would compare. I tasted some and was pleased that they were delicious. They reminded me more of pistachios than soy, so I treated them as if they were nuts. I chopped them and thought about how I could use them as a crunchy element in my dish. I turned my attention back to the peach. I diced up some pears that we had on hand and added a little bit of cinnamon. The whole time I worked, Trevor peppered me with questions. "Chef Mommy, what is your plan for the unripe peach?" "Chef Mommy, I see that you've chosen to chop the edamame. How will you be incorporating it?" "Chef Mommy, will you be putting brown sugar on anything besides the fruit? I like brown sugar." And, "Chef Mommy, I am going to have to mark you down in points if you don't use the macaroni noodles AND the cheese sauce." As he continued his commentary, I used a biscuit cutter to make personal-size rounds of pie dough and put a heap of pear/peach mixture on top. I added a second piece of pie dough, and crimped the edges with a fork. I dusted them with cinnamon sugar. I sliced the leftover scraps of pie dough, dusted them with nutmeg and put them on the same pan with the mini pies. I put the pan into the oven and turned my attention back to the entree. As I sliced the steaks, I thought about what to do with the mac n cheese. By far, this was the most difficult ingredient. I combined the powdered cheese with just enough water to dissolve it, then beat in whole milk until it was thin and the cheese wasn't so concentrated. I made a roux to thicken it slightly, then set it aside. I experimented with crusting the meat with the edamame, but it didn't work at all. Time for something different. I pulled a tube of prepared polenta from the fridge and cut it into slices. I pressed the chopped edamame into each slice, then fried them in butter. It worked. The edamame actually stayed in place. I seasoned the beef and did a quick saute, then it was time to assemble. I put a bed of greens on each plate, then rested two polenta rounds next to it. I drizzled the cheese sauce onto the greens, then topped that with slices of beef. Finally, I sprinkled the nutmeg pie crust pieces on top like croutons. The judges were excited to dig in. I'm happy to report that dinner was a success! For the most part, the judges were pleased with my use of the mystery ingredients and thought the meal was tasty. Trevor marked me down a bit for not using the macaroni noodles, plus he felt that my use of the steak was too expected. For dessert, each person got a personal peach/pear pie, plus some extra of the filling. It was a hit. Another successful deRosier Chopped Challenge! 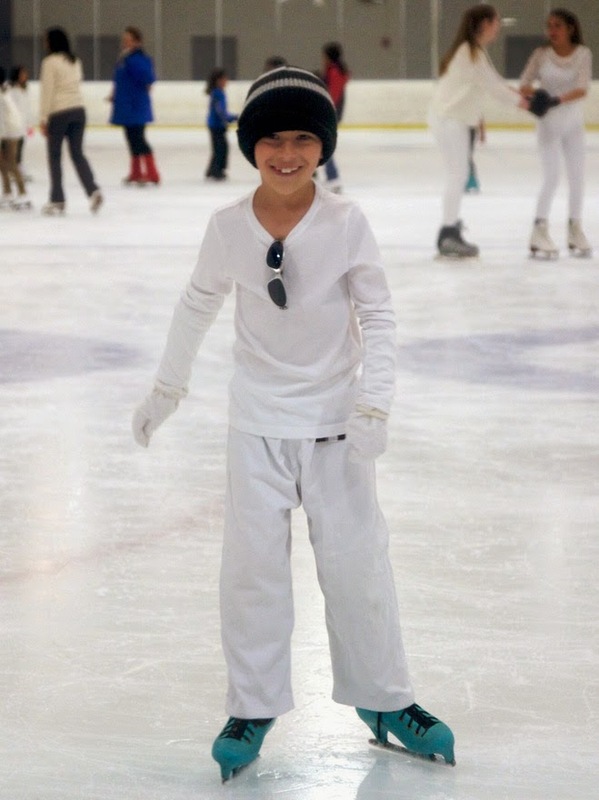 Trevor started taking ice skating lessons four weeks ago. He'd originally tried ice skating for his Cub Scout belt loop last year and liked it, but still needed to log more time on the ice to complete the belt loop. His recent success with roller skating lessons made me decide to look into ice skating lessons. 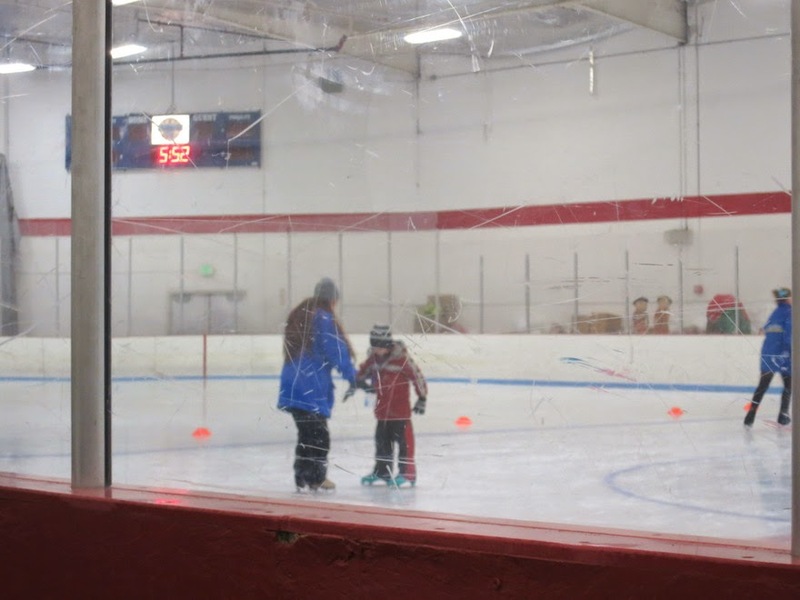 Happily, I found affordable beginner lessons ($14/hr including skates), close to home (7 miles), with the first class free. Best of all, we didn't need to wait until the new session began. Trevor had his first lesson the day after I called. He fell a lot that first day. One of the instructors worked with him one-on-one for most of the lesson and he made great progress. Despite all the falling, he loved it. Trevor's first lesson was on Week 7 of a 10 week session. Week 10 was a recital. So Trevor had exactly three lessons before he performed in front of an audience. And I had three weeks to pull together his costume. His class was performing a simple routine to "In Summer" that Olaf sings in the movie Frozen. They were instructed to wear all white, plus sunglasses. Sunglasses, no problem. All white? Big problem. Trevor literally owns nothing that's solid white besides socks. I checked the hand-me-downs waiting for him in the closet. Still no solid white. I was dead-set against spending money and time searching for white pants and a warm white shirt/sweater that he wouldn't likely need again. I started asking friends and ended up borrowing a white long-sleeved shirt and karate pants. The pants were big, so he'd be able to wear grey sweatpants underneath and stay warm. I wasn't able to borrow a white hat, but I figured his black/grey hat would make it easier for us to identify him in a sea of white. He was fine with that, but he really wanted white mittens. I thought for awhile and came up with a way to make a very quick pair of mittens using materials from my dresser. More on that in a bit. Here is Trevor's performance. Look for the kid in the middle with the teal skates and black/grey hat. Pretty good for 3 lessons, I'd say! Here's a closer look at his costume. Can you figure out what I used to make his mittens? Remember, I have no sewing skills. And it only took me about 3 minutes. Did you guess socks and scrunchies? I used a pair of my white socks, put them over Trevor's hands, and marked how deep the thumbhole should be. I sewed a simple V along the mark, then used scissors to snip down the middle of the V. I turned the socks inside out and they were ready. I did a pretty bad job sewing them, but no matter. When it was time for his performance, we slid the socks all the way up his arms, put the scrunchies on his wrists to keep the socks from sliding down, then put his white shirt over them. The long socks kept his arms nice and warm under the relatively-thin shirt. Trevor was happy. I spent no money and almost no time on the costume, so I was happy too.